Platform Device and Method for Detection of Bacterial Lipopolysachharides in water and serum. Shalini Gupta, Prashanta Kalita, Anshuman Dasgupta and Venkataraman Sritharan. Patent Application No. 3214/DEL/2014. 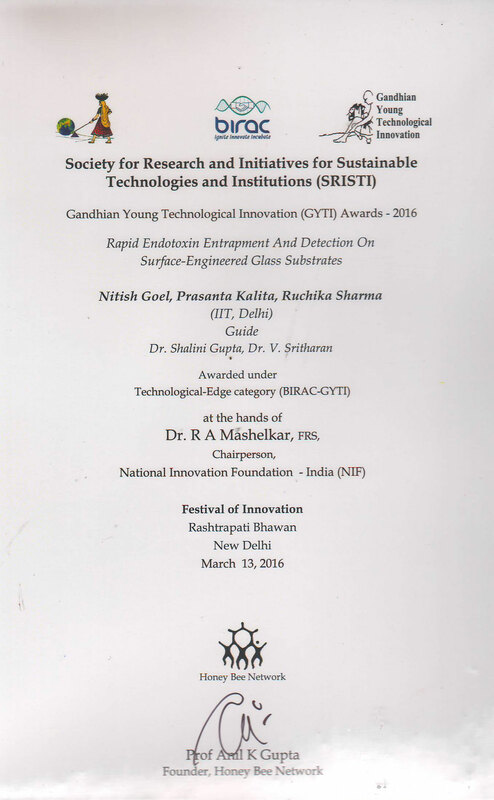 Our collaboration with Dr. Shalini Gupta, Dept of Chemical Engineering, IIT- Delhi since 2013 has been quite remarkable. Dr. V. Sritharan is an author in two patents which have been filed in 2014-16. These patents relate to development if simple nanoparticles based detection of Endotoxin in human sera. The prototype diagnostic device was awarded the prestigious Gandhi Young Technology Innovator Award 2016. Details of one of the devices were featured in The Hindu, Science, Technology and Agri section 11th April 2016. This innovation was featured in Rajya Sabha TV Science Monitor programme. Watch it below.